Sev puri is one of the most popular Indian chaat. 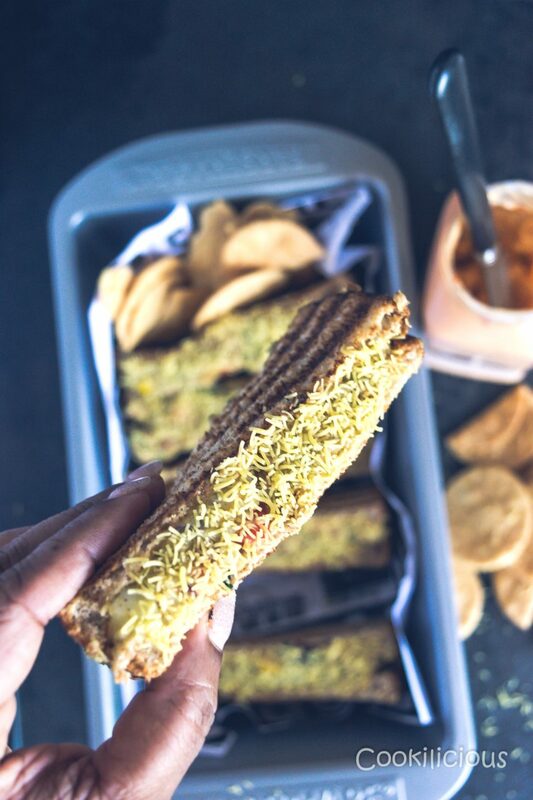 The combination of papdi, sev, potatoes, onions, tomatoes and chutneys like spicy green chutney & sweet chutney coming together to make a sandwich makes this vegan street snack simply irresistible. 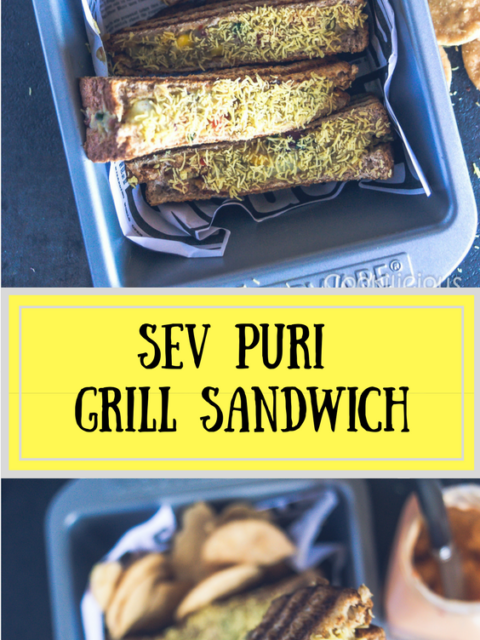 Sev Puri Grill Sandwich is like having the best of two worlds and how! OMG, just the mere mention of this yummy snack makes my mouth to water! Actually I cannot decide whether I love the traditional Sev Puri more or the Veggie Grill Sandwich! They both have played a pivotal role in college years. We had some popular street food vendors right outside our college and that was our go-to place during breaks or even after college, before we headed home. Our college didn’t have a canteen so we would either carry lunch boxes or eat outside the college. In my five years of college, I hardly remember going to a restaurant for a snack. Restaurants were reserved for special days like Saree Day, Annual Day or Friendship Day. Regular college days were meant to relish the snacks served by the vendors on the road. Me and my girlfriends would share our food and we would enjoy eating off each others plates. Aah, the little pleasures of teenage life! I came to know about this recipe from one of my girlfriends. She had been to some event and she happened to eat a Sev Puri Sandwich there. She of course loved it and called me to share the recipe. Based on her assumption of what went in it, I decided to make it for myself and Thank God for that! I am so in love with this fusion recipe that I can see myself making it more often. 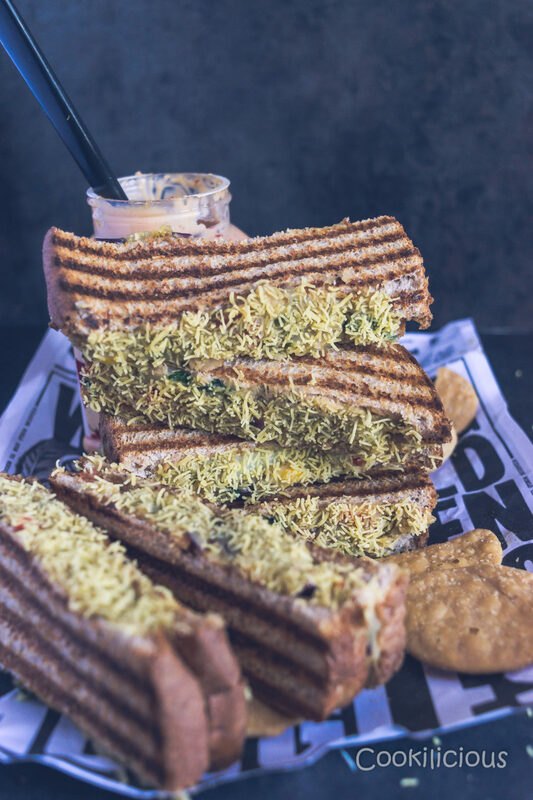 It has all the flavors of sev puri but in a sandwich form. That makes it a hearty meal than a light snack. Its tangy, spicy, crunchy and very appetizing. I informed my friend that I had recreated the recipe she had given me and she made me promise her that I will prepare this dish for her once again whenever we meet next. I do not have any problem with that as I love to feed my friends every time we meet. 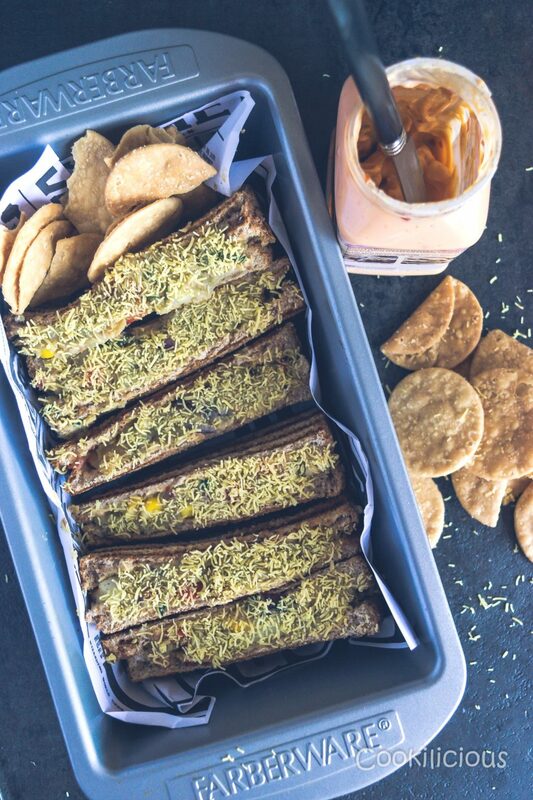 But truly, this recipe is one great fusion of two mouth-watering snacks that you must surely try for yourself. /chutney. This dish can be enjoyed for evening snack or evening for breakfast. 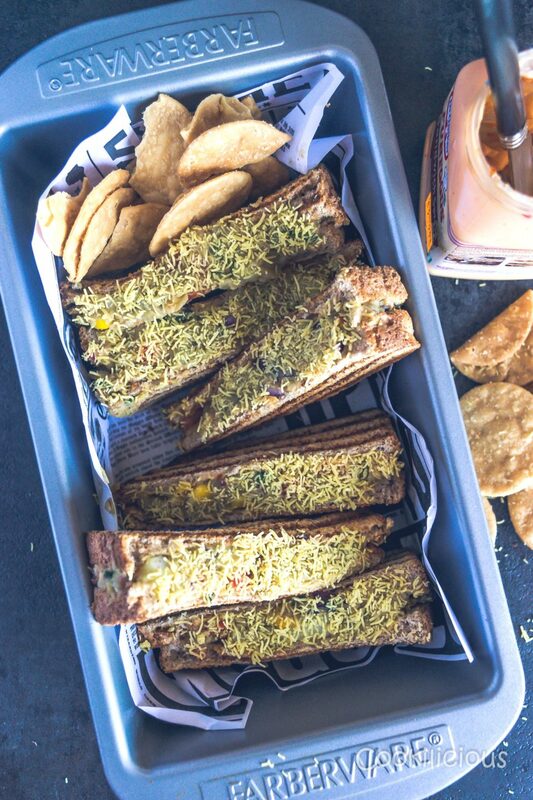 You can make the filling in advance and prepare these Sev Puri Grill Sandwiches as you need them. Just remember to add the papdi and sev only before making it. First step is to boil the potatoes. Boil potatoes with salt, turmeric powder in vegetable stock. Peel them once they are cooked and then mash them. Transfer it to a mixing bowl. Add chopped onions, tomatoes, boiled corn, bell pepper, cilantro and green chillies to this. Next add green chutney and sweet chutney. Then add crushed papdi and then thin sev. Season with lemon juice, sandwich masala and salt. Mix it all together, well. Spread sandwich spread over bread slices. If you do not have sandwich spread handy, you can apply regular butter and chutney. Then add and spread a generous amount of this potato mixture on the bread. Top with thin sev and grill. Indian street food is considered by some to be the hidden gem of Indian cuisine. I personally love Indian street food because not only are the appetizer-sized portions ideal for snacking, the varieties offered are immense and they cater to your taste buds on point. 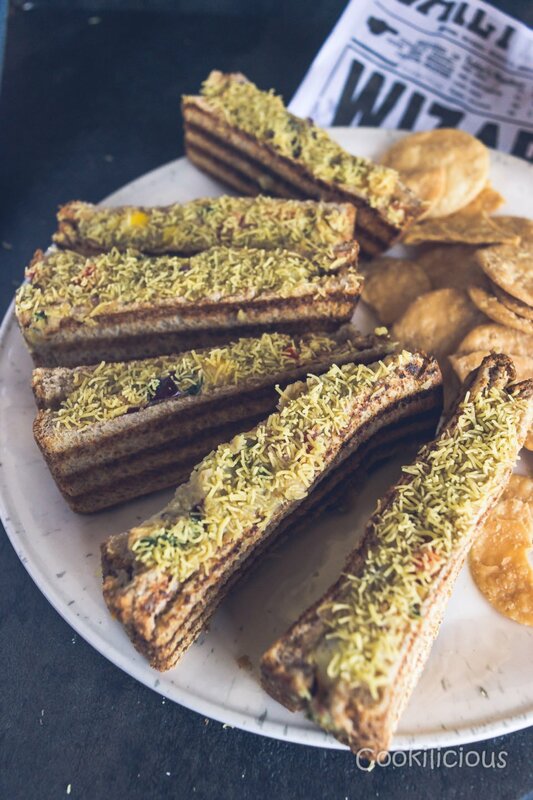 I have shared few of my favorite street food recipes here which you can check out as well – Bombay Special Vada Pav, Pav Bhaji Masala, Black Chana Chaat, Masala Toast, Vegetable Frankie, Dahi Ragda Puri, Ragda Pattice, Spicy Sweet Potato Tikki With Chole Chaat and Masala Soda/Coke Popsicle.